When Anaheim needed a big goal in Game 6 of their Eastern quarterfinal series against Dallas, Devante Smith-Pelly was just where he hoped he’d be with the game on the line. With less than a minute to play and trailing by a goal, the Ducks were in desperation mode, pressing to net the equalizer against a formidable first-round opponent. It was Smith-Pelly who played the role of regulation hero, scoring his second goal of the game with 24 seconds left, sending the contest to overtime. Less than three minutes into the extra frame, Ducks forward Nick Bonino ended the game and the series. For the 21-year-old Smith-Pelly, Anaheim’s second-round pick in 2010, it was a night to remember. It’s also the type of game that is familiar to Smith-Pelly. In 2009, when a member of the Ontario Hockey League’s Mississauga St. Michael’s Majors, it was his goal second goal that ended the second-longest game in OHL history, as the left-winger scored in triple-overtime to eliminate the Barrie Colts in the conference quarterfinals. 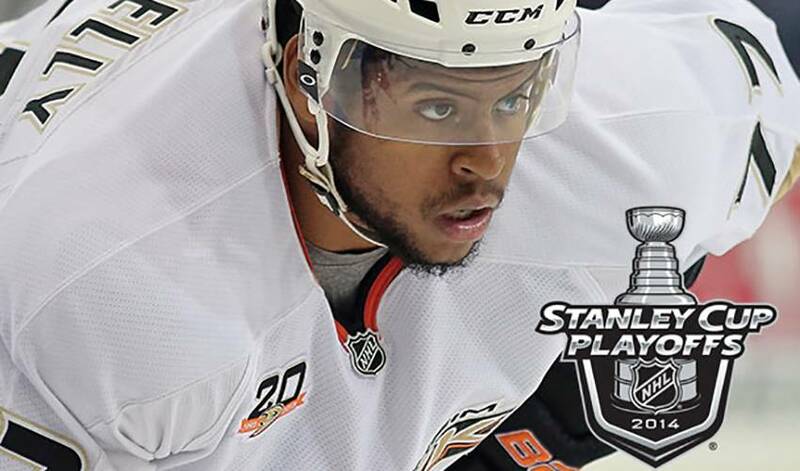 “That was the biggest goal of my career,” said Smith-Pelly, who hails from Scarborough, Ontario. It’s not just the coaches who believe in the young forward. Two days after moving on to the Western semifinals, Smith-Pelly was still catching up on the deluge of text and phone messages he received after Round 1. Not that he’s complaining. And he was certainly not complaining about having some time off before the Ducks faced-off against state rival Los Angeles. That is precisely what the Ducks have in front of them now, as they find themselves trailing the Kings 2-0 in their Western Conference semifinal series, after dropping the first two games on their home ice. Anaheim will no doubt look for production and contributions from their younger support players, a group that includes Smith-Pelly, to battle back against Los Angeles. Down, but not out, everyone in the Ducks dressing room understands what is at stake. For one of their emerging talents, it presents an opportunity to net another big-time goal and help turn the tide of the SoCal series in Anaheim’s favour. Something Devante Smith-Pelly certainly has a knack for.